Saboteurs blow up an Egyptian pipeline that supplies gas to Israel and Jordan, for the 12th time in the past year. Saboteurs blew up an Egyptian pipeline that supplies gas to Israel and Jordan, for the 12th time in the past year, security officials said told AFP. The officials told the French news agency that the latest attack occurred overnight Saturday (local time) as masked gunmen planted explosives under the pipeline in the Al-Massaeed area, close to the town of El-Arish in the north of the Sinai Peninsula. Witnesses said they heard a very loud explosion before a large fire broke out. Emergency services were rushed to the scene to try to control the blaze, AFP reported. There were no immediate reports of casualties. The pipeline, which carries gas through the Sinai and on to Jordan and Israel, has already been attacked 11 times over the past year. Last week, the Egyptian military foiled a planned attack on a natural gas plant in the Sinai Peninsula. Local media reported that masked men in two four-wheel cars approached the plant, which is located 10km south of El-Arish, and attempted to plant explosives, but found the armed forces and local guards lying in wait. A gunfight ensued. The last attack on the pipeline took place on December 18, but Egyptian officials said that it did not appear that any of the precious resource was leaking from the pipeline. 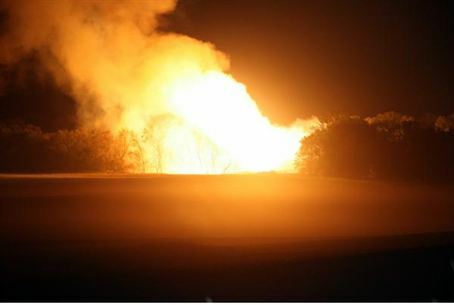 The previous attack on the pipeline took place just three weeks before the tenth attack. In late December, Egyptian security officials arrested a man in connection with the repeated attacks.